This is the first footage of one orbiting robotic spacecraft taken by another orbiting robotic spacecraft at Earth's moon. "Flow," one of two satellites making up NASA's Gravity Recovery and Interior Laboratory (GRAIL) mission, captured this video of NASA's Lunar Reconnaissance Orbiter (LRO) as it flew by at a distance of about 12 miles (20 kilometers) on May 3, 2012. 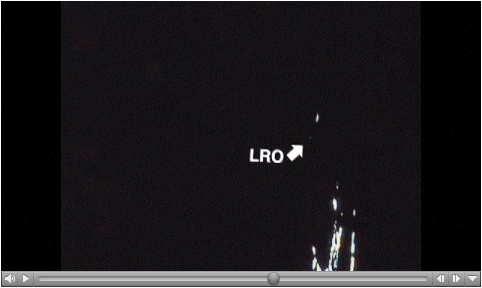 LRO is the single bright pixel that moves from top left to bottom right. The moon's south polar region is in the background, much of which is in darkness. This footage was taken by Flow's "MoonKam" camera. For more information about GRAIL, please visit http://grail.nasa.gov.